I hate to say it but the terrorists beat me. Well not wholly, but they made me change what I would normally do. I admit that when I was in Brussels last week I had an afternoon off work and rather than head into the town center for the obligatory sightseeing, I stayed in my hotel room and binged on British TV. Why? Because knowing that this week was well known for Trump and other heads of state visiting Brussels for a meeting with NATO I decided it was prime time for an attack. It’s ridiculous really that this was driving me to make a decision to NOT go out. It’s the first time that’s happened to me, and I hate it because I feel like they finally got to me. Having said that, I did go back to Brussels airport departures where the attack happened. I couldn’t real avoid it and had to face it. On my own too. As I queued to check in, I recollected that day and the terrifying events. I was queuing not far from where the first bomb went off. My heart raced and I looked around at everyone near me. I wasn’t sure I could stand there waiting for much longer. I felt vulnerable and suddenly exhausted. 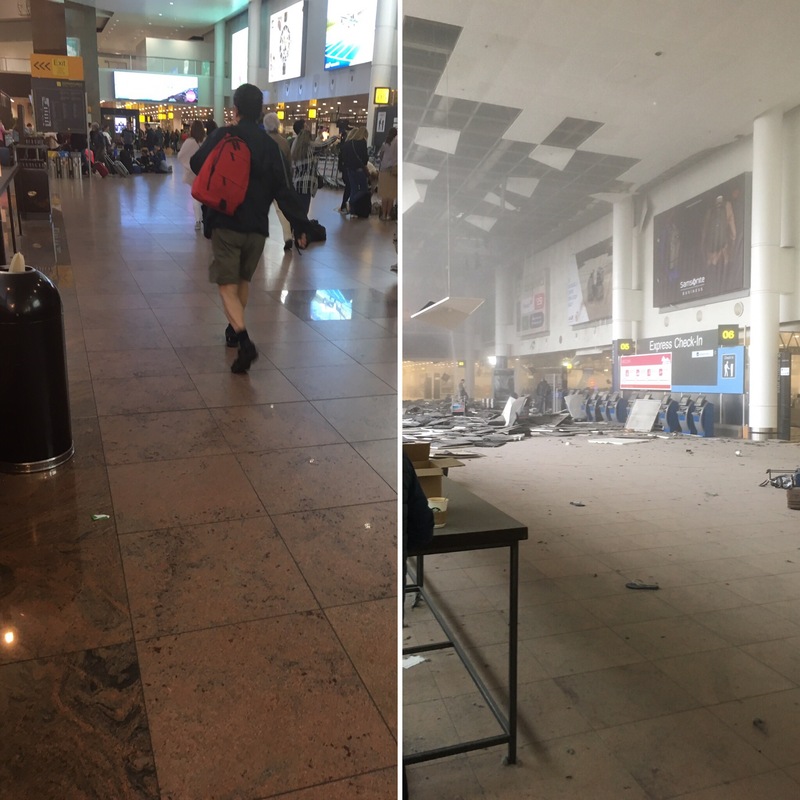 The departures floor looked the same but different to before the attacks. The queue started moving and I stopped thinking about that day and moved on. I took a picture from where I stood in the aftermath of the bombs and rather stupidly had taken a photo. I wanted to compare. Brussels airport has a new improved security check which meant I moved through quickly, but only two customs security officers which meant a huge queue to get to the gates. An American in front of me turned and said ‘I don’t want to sound like a privileged American, but this line is ridiculous’. I said to him, ‘do you remember the attacks last year? Wouldn’t you want it to be slower if it meant more secure?’ He looked apologetic. Then I realised…again they had won. The damage had already been done. Thinking about the suicide attack in Manchester got me wondering about the terrorist’s chosen venue and victims. Those caught up in the events who lived to see the day like I did, they are young and impressionable. They probably never cared about politics, international affairs or the threat of ISIS. But this week they do. And if they feel like me they will be inspired to prevent the terror from spreading to more innocent lives. I have thought seriously about how I can do something in my line of work. And yet, there I was hiding away in my hotel room rather than enjoying the beautiful sights of Brussels. It’s messed up. What kind of world will Aviana live in in 20 years time? Will this be the norm? Or will this be a historic period she will study as a tumultuous past? If infertility taught me one thing, it was that it is perfectly possible to be both happy for someone whilst being utterly jealous of them at the same time. It happened often – a friend or even an acquaintance would share their joyous news of their pregnancy or arrival of their newborn baby. Of course, I was happy for them, but part of me was sad and jealous. Sad for myself and our infertility situation, and jealous at the same time that I couldn’t have what they have. Of course I would never have said it to their faces that I was jealous or sad at their news. But I sure felt it. Happiness always won in the end, because I knew very well that every single conception is a wonder in itself and the great joy it would bring to them in the end. And in the midst of infertility I learned to be OK with those confusing feelings, it turns out it is pretty normal. It’s been a long time since I felt that way, happiness and jealousy at the same time. But I recognized it immediately when it happened to me once again. You see, I wrote a post about happiness is…..a while ago. Everything on that list made me greatly and truly happy, but there was something on that list that also made me sad and jealous. Chris getting promoted to director at work. I was insanely jealous, and still am to be honest. It’s not often I am jealous of Chris! And he knew it as well. He told me he was nervous about telling me and how I would react. My instant and natural reaction was happiness, but it didn’t take long to make me think about me. I know selfish. Because Chris deserves the attention for his awesomeness and hard work he put in to get that promotion. However, it made me think about the sacrifices I have made to my career progression to bring a child into this world. Now, my sacrifices have been somewhat limited compared to some women I have met who have stopped working, or been trapped into changing careers because of infertility. My sacrifices are not as great. And indeed, my sacrifice is not uncommon when it comes to taking maternity leave. But it’s the combination of both that do make it worthy of consideration in a different light. What did I sacrifice? I’m not sure what would be different if I either didn’t go through infertility, or have a baby, but here are my thoughts on where I have sacrificed my career development. I couldn’t take on all the projects I could have otherwise done if it hadn’t been for infertility treatments and pregnancy. I couldn’t always travel to the places I needed to, someone else did for me or the opportunity was lost. I needed stability in my work to ensure that I could face the infertility treatments, so I didn’t always take on the work I would ordinarily have done before. I had two interviews that I really did not do my best at, because I was distracted. I have been out of work for almost 7 months, but it was probably actually longer than that because of course I had to wrap up and handover work before going on maternity leave, so I checked out earlier than that. My brain wasn’t at its best in my third trimester, and probably not my in my first either because of my heightened awareness to the risk of potential loss of pregnancy. Pregnancy on the face of it doesn’t stop career progression, it just delays it a little bit. I’d do that any day to have my daughter, of course, that goes without saying. But that doesn’t stop it being a fact, and I’m not the only woman, others face similar. Some women take a whole year off work, some take several years off work to care for their children. What about child number two or three? It’s just the way it is. If we were in the UK, perhaps Chris would have taken parental leave instead and I would have gone back to work earlier? Who knows. Would it have slowed down Chris’s opportunity for promotion if he went on parental leave? By how much, if at all? I have no doubt we would like to think it would have ZERO impact on that potential, but by not being physically at work progression stalls. I have often read that it is at this point in life where the bias for a man and woman with a family becomes more apparent, where a man having a family is seen as a positive, and woman with a family is seen as a negative. I personally haven’t experienced this myself, but it makes you wonder. But I also fought to maintain my career progression. I decided to keep doing my executive development programme despite being pregnant and on maternity leave rather than postpone it. I made sure I still went on transatlantic work trips even in my third trimester. So, it’s not like I abandoned all effort in my career development. I’m not saying that if I hadn’t gone through infertility treatment and got pregnant that I would be promoted by now, far from it! But rather, if I had have been at my best during this period, then it is unlikely I would be jealous of Chris’s promotion. Isn’t that an odd thing? How is it that Aviana is yet another month closer to being a year old? Aviana has had an amazing month. Aviana and I went back to the UK for a work trip whilst Aviana hung out with Granny and Grandpoo. Aviana has been going through that phase where she doesn’t want to be left alone as well as great frustration at not being able to get where she wants to go. She isn’t crawling still, but she can get somewhere if she really wants to by scooting around on her bum. She can pull herself up, but is very awkward about it all. She can stand on her own for a few seconds and is pretty confident now when I just hold onto one hand whilst she stands. She can push herself along whilst holding onto her A frame walker, as well pushing herself on her ride along car that my parents bought her. Having seen her have lots of fun on it, Chris immediately went out and bought her a little giraffe trike – her feet just touch the floor, it’s pretty cute watching her poot along. But she still can’t get herself up from lying to a seated position which is very frustrating for all of us! Aviana was a trooper on the flight back to the UK. We ended up having an entire row of the whole plane to ourselves! She slept the whole way, thankfully. I got very little sleep because I was paranoid about her dying in her sleep whilst in her car seat, so I kept checking her all the time. The return flight I was dreading. Firstly because we didn’t have seats next to each other because the plane was pretty much full, but when I checked in they had two bulk head seats available. This was amazing because it meant that Aviana could sit on the floor and play at my feet without toys rolling under the seats and down the plane! We walked up and down the aisle and she was the star of the plane. She literally stopped to say hello to EVERYONE and everyone was obliging in talking to her. Too cute. My heart was melting. It was a very friendly flight, I had so many offers of help! I met a US Navy man on the flight who had a daughter who was one week younger than Aviana, and he was returning home after a short deployment. Prepare for tears!!! His daughter literally just cried when his wife gave her to him. She didn’t recognise him! Well, funnily enough Aviana did the same the next day with Chris when she woke up from her nap once we got home! It had only been two weeks, but it was enough to make her cautious. However, the next day, it was all about the daddy hugs. She was probably just punishing him for him being missing for past two weeks. I hope the sailor’s daughter forgave him soon after too!! Aviana has started to refuse solids, she prefers feeding herself with finger food and doesn’t like mushy food. So sweet potatoes and mash potato that she used to like? Nope. Salmon? Nope. But she will oblige to oat meal/porridge, risotto and yoghurt being spoon fed to her, but very little else! The past week day care have not been able to get any food in her unless it is bread or rice cakes. Fortunately she is still drinking her milk so I am not worried. I’ve looked into it and it’s very normal at this age. We just need to be relaxed about it, keep offering her a variety of foods, make dinner fun still, but not stress or force feed her. We’ll also keep trying to get her to learn how to spoon feed herself when we have the chance to be messy, so hopefully that will help. Luckily peas, cheese and blueberries are still a hit, as well as falafel! So I’ll take that as a winner. She’s great at drinking water and milk from her munchkin 360 cup by herself, so I think transitioning away from bottles will be easy. I love how interactive she is now, so much fun. She has learned how to high five and wave hello and goodbye and my favourite is that she has learned how to squirt water from her squeezy toys, squirting herself and making farting noises on her tummy with the air! Aviana still fits in some of her 3-6 month clothes where they were dresses she can still wear as shirts, and her trousers still fit her, but are more like shorts! But length wise she is in 9-12 months, but they swamp her arms and body! I also finally found some shoes for her to walk in that actually fit her long skinny feet…of course, I found them in the UK, size 3-6 months.